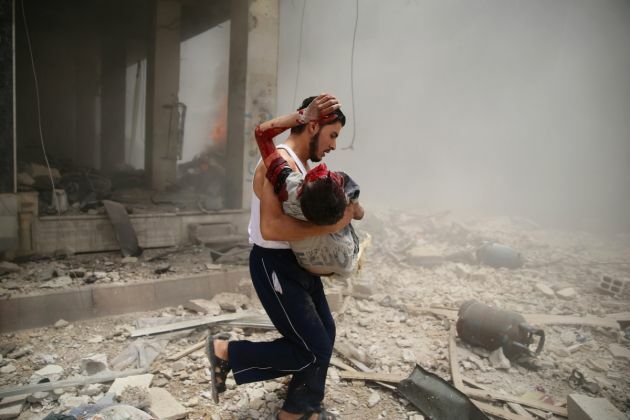 (Photo: REUTERS / Mohammed Abdullah)A man carries an injured child after what activists claim was a car explosion in a market in Douma in the eastern al-Ghouta, near Damascus June 28, 2014. Dozens of people were wounded when a car bomb exploded in the Syrian town of Douma, northeast of the capital Damascus, on Saturday, local activists and a monitoring group said. GENEVA - Mass atrocities by Government forces and armed groups such as the Islamic State continue to take place in Syria and amount to war crimes, says the United Nations. The atrocities are causing immeasurable suffering to civilians, and are accelerating international instability, a United Nations report released Wednesday in Geneva has found. The report stated that the continuous influx of foreign fighters and the success of extremist groups such as the Islamic State of Iraq and Al-Sham are among the factors which had contributed to a spillover of violence affecting international peace and stability. "Risks of the conflict spreading further are palpable" the report said. The media has documented recent acts of genocide against Christians, Shia Muslims and other minorities in Iraq which seems to be a mirror for similar atrocities in Syria. The U.N. report, based on 480 interviews and documentary material, "chronicles the unimaginable brutality and human cost of the Syrian conflict." Fighting has engulfed civilian areas, destroying the barest possibility of normal life. The impact has been particularly grave for women and children, whose most basic rights are being infringed daily. "Hundreds of civilians are dying each day as the fighting goes on with no regard to law or to conscience," said Paulo Pinheiro, chair of the Commission. In areas of Syria under Islamic State control the marauding group also known as (ISIS and ISIL), particularly in the north and northeast of Syria, Friday, the Islamic Sabbath is regularly marked by executions, amputations and lashings in public squares. Civilians, including children, are urged to watch. Bodies of those killed are placed on display for several days, terrorizing the local population. "Women have been lashed for not abiding by ISIS's dress code. In Ar-Raqqah, children as young as 10 are being recruited and trained at ISIS camps. Some States continue to deliver mass shipments of arms, artillery and aircraft to the Syrian Government, or contribute with logistical and strategic assistance. Other States, organizations and individuals support armed groups with weapons and financial support says the report. "The weapons they transfer to the warring parties in Syria are used in the perpetration of war crimes and violations of human rights. The Commission has recommended the imposition of an arms embargo and called on the international community to curb the proliferation and supply of weapons." The report adds, "ISIS has forcibly displaced Kurdish communities in northern Syria. Journalists and other media workers are systematically targeted." The U.N. Commission reports that "members of ISIS have committed war crimes and crimes against humanity in Aleppo and Ar-Raqqah governorates including acts of torture, murder, enforced disappearances and forcible displacement. "ISIS poses a clear and present danger to civilians, and particularly minorities, under its control in Syria and in the region," Pinheiro warned. Other non-State armed groups continue to commit violations, including summary executions and shelling deliberately targeting civilians. Many of these killings are massacres, as defined by the commission. Homs city has been rocked by over a dozen car bombs since this April. Jabhat Al-Nusra has claimed responsibility for some of these attacks. Armed groups continue to shell Government-controlled areas of Aleppo and Damascus, causing civilian deaths and injuries.